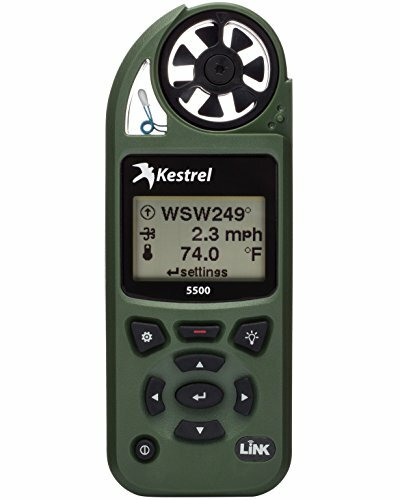 The Kestrel 5500 Weather Meter comes packed with 14 separate environmental measurements including heading, wind direction and speed (current/average/max), cross/head/tail wind, altitude, pressure trend, barometric pressure, wet bulb temperature, relative humidity, heat stress index, dewpoint, density altitude, wind chill, and air/water/snow temperature. Engineered for performance, the 5500 features a large, backlit screen for easy viewing in bright sun with night preserving lighting for work in darkness and has a user-replaceable impeller protected by a flip-top cover. The rugged design is fully waterproof and IP67 and MIL spec rated for use even in the most demanding conditions. Use the included Vane Mount to turn the 5500 into a hands-free portable weather station. The 5500 tracks and logs time-stamped data and has customizable storage for 2900 data points. The Bluetooth Kestrel LiNK model includes custom communication software so you can configure, view, graph, and transfer data and monitor measurements in real time via the free LiNK app on your iOS/Android device from up to 100' away. Use the USB dongle or cable (sold separately) to connect with your Mac or PC. The design and function of the Kestrel 5500 make it an indispensable tool for many applications including research, military and law enforcement, meteorology, boating, aviation, hiking and mountaineering, hunting, and agriculture. Includes AA battery, neck lanyard and protective zipper pouch that holds the meter and Vane Mount. The Kestrel 5500 is proudly designed and manufactured in the USA, and is backed by a 5-year warranty. View More In Recorders & Data Acquisition. If you have any questions about this product by Kestrel, contact us by completing and submitting the form below. If you are looking for a specif part number, please include it with your message.